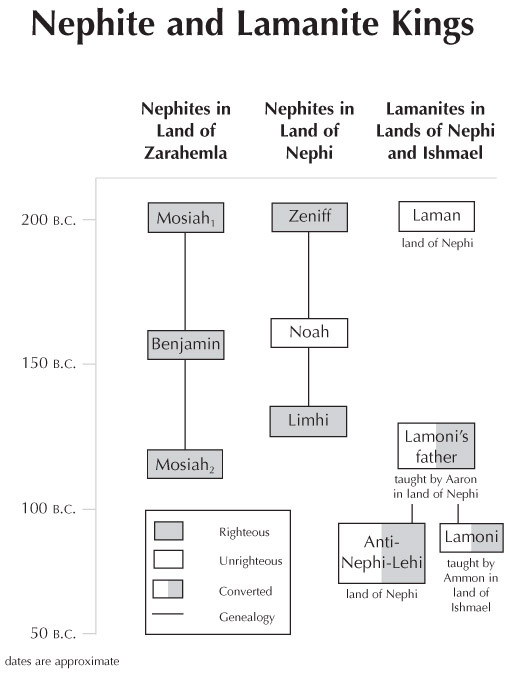 This chart highlights prominent Nephite and Lamanite kings from 200–77 B.C. These men are described in great detail in the Book of Mormon, showing especially the great effect a leader can have on his people. Mosiah1, Zeniff, and King Laman were contemporaries. Benjamin was beginning his reign when Noah was at the height of his power. Limhi's reign ended when he and his people returned to Zarahemla near the beginning of Mosiah2's reign. Lamoni's father, who may have been a descendant of King Laman, was converted by Aaron about 82 B.C. Lamoni himself was converted a little earlier by Ammon. Lamoni and King Anti-Nephi-Lehi were brothers (see Alma 24:5).